The ocean holds a bewildering array of microscopic life. Many of the smaller organisms are difficult to study or even to identify under a microscope. For this reason, scientists often look at the genes of these microbes to figure out how they are related to one another, and what they are doing out there in the ocean. Such genomic analysis often involves searching large databases to compare the genetic material of one microbe to that of others. Unfortunately, our existing databases are woefully incomplete when it comes to microbes in the ocean. The genomes of some marine bacteria have been sequenced and cataloged, but many other groups of organisms are missing. To help address this problem, MBARI microbiologist Alexandra Worden recently helped compile a groundbreaking database that provides a wealth of data on an immense, but little-studied group of marine microbes—the "microbial eukaryotes." In June 2014, Worden and several dozen other researchers described the results of their "Marine Microbial Eukaryotic Transcriptome Sequencing Project" (MMETSP) in an article in PLOS Biology. Eukaryotes are a hugely diverse group that includes everything from humans to tiny algae less than one thousandth of a millimeter across. These organisms are grouped together because they all contain cells with well defined internal structures (organelles). Bacteria, in contrast, lack these structures. Perhaps because they are so diverse, the tiniest eukaryotes in the ocean are poorly studied. Even miniscule eukaryotes have large, complex genomes, compared with bacteria. Because it takes so much time and effort to sequence these genomes, most of the eukaryotes that have been sequenced are those deemed significant from a biomedical or agricultural standpoint—animals, plants, fungi, and parasites that infect plants and animals. Unfortunately, the genomes of animals, plants and terrestrial fungi are not very useful for marine microbiologists, because they are so biologically different from most eukaryotic marine microbes. Although large databases exist for genetic information on marine bacteria, until now there has been no database covering even a fraction of the microscopic marine eukaryotes. To avoid the expensive and time consuming effort of sequencing the genomes of hundreds of microbial marine eukaryotes, the researchers used a quicker, simpler method to gain an overview of these organisms' genetic code. Instead of sequencing the organisms' DNA, they sequenced mRNA—a partial copy of the DNA that provides a blueprint for ongoing biochemical activity within a cell. The result was a "transcriptome" for each microbe, containing only the genetic material that was being used ("expressed") by that population of microbes at a particular moment in time. Transcriptomes are generally much smaller and simpler than genomes, and include less duplicated genetic material. Researchers from around the world grew cultures of over 650 microbial eukaryotes and sent extracted RNA to the MMESTP contracted sequencing center, which sequenced a transcriptome for each. The resulting database includes some of the most abundant and ecologically important microbial eukaryotes in the ocean—organisms that support global fisheries, supply oxygen, and absorb carbon dioxide from Earth's atmosphere. The database dramatically expands the amount of genetic information that is publicly available on many common marine organisms. 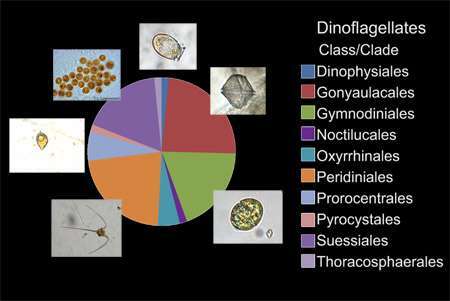 For example, among the dinoflagellates (a common marine algae), only one species in one subgroup has had its genome sequenced. But the new database contains transcriptomes for about 47 species within ten different subgroups. It also includes transcriptomes for several microbes whose genetic material has not previously been studied at all. Because this database is free to all researchers and contains detailed information on so many different types of organisms, Worden and her coauthors predict that it "will have far-reaching impact beyond the field of marine science." They continue, "Experience has shown that such data can provide the platform needed to transform our understanding of the basic biology and function of these organisms." For example, by analyzing the information in the MMETSP database, scientists may be able to tease out the evolutionary relationships between major groups of eukaryotes, both unicellular and multicellular, whose origins are poorly known. The information could also lead to breakthroughs in understanding the ecology of marine microbes—how they interact with their environment and one another, as well as the evolution of terrestrial eukaryotes. The authors conclude their paper on an optimistic note, writing, "We look forward to the many creative analyses and results enabled by the MMETSP and the minds of the broader scientific community."